Ayya Yeshe, Mahendra Khobragade and Shallini Rangare, all long term employees of Bodhicitta Foundation attended the 2015 Sakyadhita Conference (an organization to empower Buddhist women). The conference topic was ‘Compassion and Socially Engaged Buddhism’. We delivered a workshop about the work we do in India with ex ‘untouchable’ Indian Buddhists. We met many wonderful activists, Inspiring female teachers and learnt more about Buddhist women and the challenges they face in accessing full ordination, access to education and resources and the challenges with patriarchy or being a Buddhist minority. Two women we met really stood out in terms of courage. One was from Bangladesh where (as in Australia), Buddhists are only 2%. Ven Gautami spoke about how she struggled to get an education. As a lay yogi who read the ‘Therigatha’ (Poems of the Buddha’s monastic female disciples) Gautami was inspired to see that the Buddha created a fully ordained nuns community (Sangha) to compliment the monks community. After many Vipassana retreats, this young woman was inspired to take ordination. She went to Sri Lanka. In the past in conservative Theravada countries, monks (who enjoyed most of the resources and power) rejected ordaining nuns properly, but instead gave them an ‘invented’ ordination of 10 or 8 precepts whereby they are not considered monastic sangha, but rather, homeless wanderers. Nuns are not allowed to go on alms round for food and are regarded as a less ‘meritorious’ source of offering than monks. When modern scholars looked at the Vinaya, they discovered it was technically possible to revive the full ordination of women, as Bhikshunis, which would mean that hundreds of years of inequality would come to an end. Unfortunately, many conservative monks have not accepted these findings, some even refuse to look at the research. There is tremendous opposition to full ordination in Burma, Thailand, Cambodia and many other Theravadin countries. 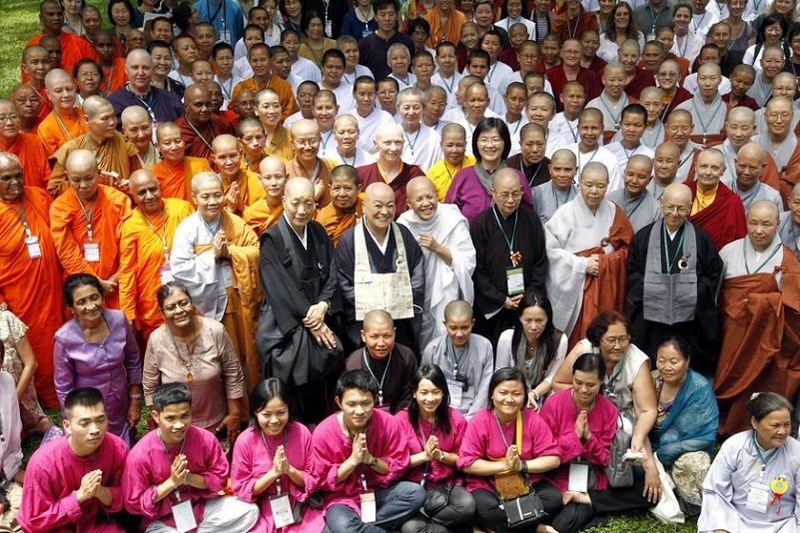 Thai Forest monks Ajahn Brahms and Bhikkhu Sujato, who performed a ground breaking Bhikshuni ordination in Australia a few years ago were ex communicated from the Thai Sangha, but they still have so much international support, it makes little difference. Now the ball is rolling and hundreds of Theravada nuns in many countries are taking up full ordination. When we asked her who had threatened to bomb her, we assumed it would be a Muslim extremist. But this was not the case! Ven Gautami said she had a wonderful relationship with the Muslims after returning from Sri Lanka. She said that the Muslims had been supportive and offered her land. It was actually the monk’s community that threatened to bomb her and demanded she disrobe. Ven Gautami held up the sutras translated from Pali into Bangla and said ‘If you will burn these sutras about Buddha ordaining Bhikshunis and the enlightenment stories of the Buddha’s female disciples, then I will disrobe. Say these are not the Buddha’s teaching, and I will disrobe.’ The monks Venerable Gautami faced the monks and said ; ‘You translated the Therigatha into Bangla, it shows that in the time of the Buddha, nuns were well respected Bhikshunis who were supported and many were well educated. If you want me to disrobe, first of all burn the Therigatha and the Bhikshuni Vinaya, deny that this is the way Buddha intended nuns to practice, then I will disrobe’. The monks could not deny the truth of what Ven Gautami was saying. She then, with great courage and dignity started gathering lay and monastic disciples, helping the poor and teaching meditation. She now wishes to invite some foreigners to Bangladesh to give full ordination! Another nun we met was a Bhikshuni. She said she was from Burma. It was only when she went to study Buddhism in Sri Lanka that she realized full ordination was even possible for nuns, as all such information is censored in Burma. The nun was afraid her photo would be taken and she would be tortured or detained on the Burma border for the ‘crime of being a Bhikshuni’ as another nun had been. Meeting these nuns made us realize that equality and access to safety, shelter, education and donations is still something Buddhist women have to struggle for in so many places of the world because of negative attitudes about women, that are more cultural than Buddhist. Jetsunma Tenzin Palmo gave a very inspiring speech about the sad situation of Western and Non- Himalayan monastics. She mentioned how they offer service and ordain with so many hopes, only to find no support and end up disrobing. She told of how one nun who had offered service in her centre for many years was encouraged to disrobe and get a job when she became ill, even though the centre supported Tibetan males. Jetsunma appealed for the support of International Buddhist women to support the Non Himalayan Nuns alliance, to raise money for the viable future of NH nuns so that they would have rate, which currently stands at 75%.